Remember, life is precious and you are loved! Aokigahara Forest (青木ヶ原) – also known as Jukai (樹海), the "sea of trees" – is a deep, mysterious forest that sits at the base of Mt. Fuji, looming powerfully overhead. The evergreen trees of this virgin forest form a thick, dense blanket, suffocating the otherwise captivating atmosphere, and the sounds of any wind or wildlife are oddly subdued, forming an eerie outdoor version of a soundproof room. It is as lovely as it is haunting, and one step into the forest makes one feel as if the very land itself is harboring a deep, dark secret. 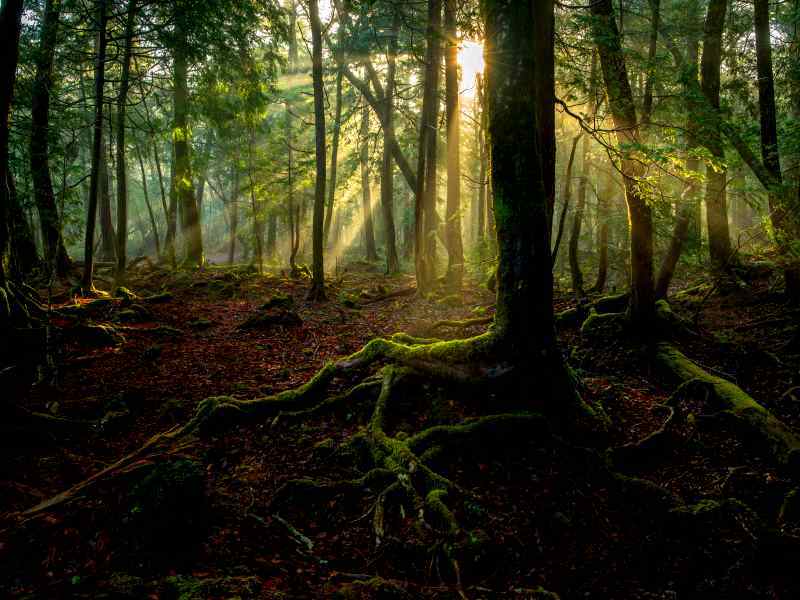 The Aokigahara Forest, despite its vast wooded landscape and natural beauty, has gravely come to be known as "the suicide forest," a morbid yet fitting nickname given the history and tragedies that are known to go on between the trees. It sprung up from the lava left behind in the aftermath of what was the most powerful eruption of Mt. Fuji in over 3500 years, called the Jogan Eruption. Thought to have occurred as a sort of divine punishment for Shinto Priests who had angered the gods by neglecting their duties, this critical event humbled the people of the entire country at the time, leading to them to worship the mountain as a god. The volcano of Mount Fuji does, in fact, have its own deity, Asama no Okami. The Kawaguchi Asama Shrine on Mount Fuji, dedicated to this deity, is also now designated as one of Fuji’s UNESCO World Heritage sites. It is easy to see why such a place would be embodied with such power. Associated with such power, the woods invoke not just awe and inspiration, but fear in many citizens of Japan, and even in people from around the world who have come to know its legend. Even before its reputation for becoming a suicide hotspot, it was littered with tragic tales of people who had lost their lives, be it by their hands, or by someone else. Aside from already being a location steeped in folklore and tales from long ago, of various yokai and spirits who called this place home, it was also known as a place where Buddhist monks would come to starve themselves as a way to "purify" themselves – an "honorable" death. It was reputedly a prime location for ubasute (姥捨て) - the supposed practice of leaving behind a sick or elderly relative (particularly a woman) one could no longer care for to perish in the woods. Some argue that ubasute is an urban legend. Either way, it shows the pull that the forest has on people's imaginations. Because of these practices, along with the already existing tales of ghosts and demons prowling about, it was soon believed that the vengeful spirits of those that died here soon joined the haunted masses, left to prowl the forest grounds for the rest of eternity. The cover of Matsumoto Seicho's book Tower of Waves, which helped influence public perception of the forest as a location for suicide. Though the forest already had a dark and spooky past on its own, it wasn’t until recently that it started to gain attention as what some soon came to call "the perfect place to die." Aokigahara is known to be the second most common place for suicide after The Golden Gate Bridge in San Francisco, and since around the 1950s, has become the final resting place for at least 100 souls per year – and those are only the ones who were discovered and recorded. It is believed that the trend really began with the publication of a 1960 novel by popular Japanese author Matsumoto Seicho (松本まつもと清張せいちょう), Tower of Waves (波なみの塔とう), which was romanticized for its plot involving the suicide of two young lovers in the same forest. The forest soon began to make its appearance in other similar copycat media, including the 2016 American horror film The Forest and a drama called Sea of Trees. Despite the original novel being purely fictional, for some reason, the idea caught on of Aoikigahara as an ideal place to die in a society that was already coping with a high suicide rate. There are several reasons people believe those contemplating their final moments choose to come here. The first is that Japan, being a mostly Shinto nation, holds a deep reverence for nature, which is believed to be inhabited by deities. Also, tall mountains are traditionally believed to be gateways to the heavens, and with Mount Fuji already being a deeply worship mountain, many Japanese had come to see this forest as the "perfect place to die": surrounded by nature, and close to the gods and spirits. Because of these beliefs, and the mystery enshrouding such practices, it is easy to see how such a trend could gain popularity as a subject for writers, filmmakers, and artist of other sorts. But it remains to be acknowledged that the horror stories that come out of this forest are not just legends – they are real life stories of real life people with real life struggles who chose to end it all. Such media is often met with conflicting opinions, criticizing the creators for sensationalizing the tragedy of the situation and having no regard for human life. It should go without saying but the act of taking one’s own life is a serious issue, and is not something to be romanticized. You can see why popularizing a location for suicide is problematic. Suicide is already the leading cause of death in Japanese men between 20-44, and the number is also rising in young adults facing struggles with school and "fitting in," as well as the elderly. And it is no hidden knowledge that even way back in ancient times, suicide was deemed the "honorable" way to go, especially within samurai classes and noble families (it was thought better to die than to live a life that brought shame on their name and family). This history, along with the strong social stigma against mental illness which discourages people from seeking help, have historically nothing to help bring down those statistics. Fortunately, the country has made progress countering these attitudes, which has helped Japan reach its lowest suicide rate in 37 years - although, sadly, rates are still climbing among teenagers. Controversy in Media: Is There Really A Right Way to Portray It? As mentioned above, certain portrayals of Aokigahara as primarily a forest of death has sparked much controversy. However none is probably as infamous as the outrage caused in late 2018 by a young (and rather ignorant) YouTuber, Logan Paul. Amongst several other outrageous displays of disrespect caught on camera during his travels in Japan, the most upsetting of them all was by and far his visit to Aokigahara itself, when he blatantly ignored the rules and the ribbons, wandered off the path, and found himself face-to-face with the recently deceased corpse of a young man hanging from a tree while he was still filming his childish antics. Rather than quickly cut off the power and alert the authorities, he continued to not only film the body of the victim, but laugh and make jokes about it, later sloppily attempting to justify it as "his initial reaction when shocked." Enraged viewers spoke out against him and against YouTube, finally resulting in the removal of the video and Paul issuing a public apology (though the sincerity of his words are still subject to question). Though Paul did apologize and supposedly even donated $1 million to a suicide prevention charity while making posts calling for awareness in an attempt to undo his misdeeds, this incident nonetheless shined a light on other issues, such as the way the forest is viewed by those outside the country, the way the media’s portrayal enhances only the horror aspect of the forest while neglecting its cultural significance, and of course, the most important, the apparent praise of the location as a haven for suicide, which many fear only stokes people on, rather than discouraging self-harm. Thanks to the over-emphasis on Aokigahara as a haven for death, and the exaggeration of the "spooky" factor for the sake of making it appear more interesting, there has also been a serious widespread epidemic of myths and misinformation. I will attempt to debunk a few here, beginning with one point I already mentioned above. The first is the Japanese view of suicide as "honorable." While yes, historically, this is definitely factual and true, the reality of the situation is that those days are long gone, and while some may personally hold on to a similar view individually, as a whole, the Japanese for the most part do not view it as an honorable deed anymore. To those who are affected and left behind, it is a tragedy. To those who are considering it, it is simply what they feel is their "only way out." In the end, the act of taking one’s life is, plain and simple, a last-resort action taken as the result of severe depression or mental illness, and has nothing to do with honor. This is seen throughout the forest as messages of encouragement are strewn along the path and tied to the ribbons left behind as trail markers, reminding people that life is precious, and set in place to provide one last bit of hope, one last ray of light, to hopefully change the minds of and turn around those wandering in who don’t plan to wander out. Another myth about the forest is that there is no way to navigate, and that all phone service and even compass usage is cut off once you enter. (Let's call this the "Blair Witch myth.") While yes, as in any forest, service may be poor, or at least not as good as in more urban areas, it is still possible to use some phones, and at the very least compasses, on the marked, safe-to-travel parts of the woods. You may have trouble in areas where the land has become magnetized due to the lava and its composition, but that compasses don't work throughout the forest is not true. (JP) Link: 5 Urban Legends of The Sea of Trees: Do Compasses Really Not Work? In the early 2000s, after many years of social stigma and silence, Japan at last recognized the national problem of rising suicide rates, and started to take several actions to help increase preventive measures and available help for those at risk. Aokigahara seeks to do the same. Though the number of suicides counted in Aokigahara have supposedly decreased since 2012, the Japanese government made the decision to stop posting these statistics publicly in the hopes of not drawing in any more attention as the "suicide forest." There are also surveillance cameras in the lots to record entering visitors, as well as park monitors and security guards who regularly check for suspicious behavior, and of course, making sure that those who come can get home. Park sweepers regularly check the parks beyond the path and follow the ribbon trails hoping to find potential victims before it is too late, and to bring home the bodies of those who did not make it. There are messages of love and encouragement plastered all over, and help hotline numbers are posted everywhere where they are easily seen. The official website for Yamanashi Prefecture also lists details about the suicide prevention measures they have taken and are taking, as well as have listed links to documents and PDFs that thoroughly explain some of their policies and activities. Now some of you may be wondering, with a forest stained in such a tragic history, why would anyone visit it? Can you even visit it? Should you? There is no specified entrance, and it is not blocked off, so it is pretty easy to access for just about any individual. There are set hiking trails and even guided tours, so it is definitely possible to visit this forest just to sightsee. Contrary to the negative image the forest has been given in recent years thanks to the aforementioned forms of media, the fact remains that Aoikigahara is still first and foremost a forest and a landmark. There are actual several tourist-geared tours and hiking courses here, and being in a prime location – at the foot of Mount Fuji, and surrounded by other natural attractions – Aokigahara has great potential for being a beautiful sightseeing spot, too. It is a mystical spot with a great historical background and a deep spiritual reverence. (JP) Link: Why Are Tourists Attracted to Aokigahara? Just like the Golden Gate Bridge is not nicknamed the "suicide bridge" despite statistically holding the highest number of recorded suicides in the world, Aokigahara should not have to live with the label of "suicide forest" for ranking at number two. There are many in Japan who desperately wish for a "re-brand" of the forest, who want nothing more than to show the people of the world its natural beauty rather than its unfortunate association with death. Perhaps if more people took the time to actually visit and spend time exploring the nature (safely, of course) and learning more about the history of the spot and the surrounding landmarks, they could help debunk the myths, dispel the stigma, and drive its popularity as an attraction for visitors who want to go home and tell their families about it, rather than wanting to stay for good. (JP) Link: ''How to Explore and Enjoy Aokigahara, the Sea of Trees! It is there for a reason. And even if your phone and compass is working, there is a reason the forest is notorious for people getting lost: the tangled trees and winding paths make it near impossible to navigate without guided direction. Also, wandering off trail increases the likelihood of stumbling upon something you might not want to see. If you see ribbons there that are not your own, please leave them be. While ribbons are often left by travelers and hikers to find their way out, they are also often left by those who go their to die and hope for the forest sweepers to find their bodies. Please leave the ribbon following to the professionals. When using ribbons to help find your own way out, make sure to take them down and bring them out of the forest with you when you leave. For one, you should not litter. But also, because forest sweepers regularly check the forest for potential victims, leaving behind ribbon could have them following yours and finding nothing at the end, thereby wasting time that could have been spent possibly finding and saving someone else. While Japan has made strides in recent years, a stigma around mental illness lingers - with sometimes horrifying consequences. Hikikomori: Is There a Path Forward for Japan's Social Recluses? Why does Japan drive some to remain secluded their entire lives? A look at Japan's "shut-ins" - and how professionals and volunteers are trying to help re-integrate them back into society. Japan's eugenics law remained on the books until 1996. Now, the victims are fighting back - and the country's government grapples for a formal response.